Pearl Amster. Courtesy of the Austin Civic Orchestra. Image available on the Internet and included in accordance with Title 17 U.S.C. Section 107. AMSTER, PEARL (1917–2000). 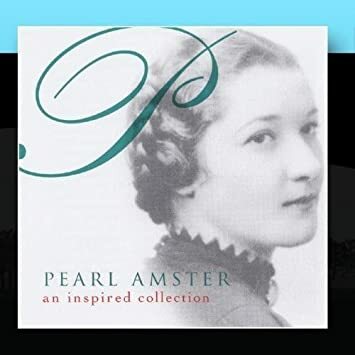 Pearl Amster, classical pianist and teacher, was born Pearl Salzman in Brooklyn, New York, on May 17, 1917, the daughter of Joseph and Dorothy Salzman. Pearl Amster was a beloved performer and patron of many Austin youth music programs. She studied under Rose Raymond and Rosalyn Tureck and performed as a concert pianist and taught music for many years. Her accomplishments include her debut at Town Hall, New York City, at age sixteen; her recognition as the first woman awarded an artist diploma from the National Guild of Music and Teachers; her performance at Steinway Concert Hall (a part of Carnegie Hall) in 1953; and her compact disc, An Inspired Collection, recorded on her eightieth birthday. Pearl Amster's Album, An Inspired Collection, 1999. Image available on the Internet and included in accordance with Title 17 U.S.C. Section 107. In 1967 Amster and her husband, Gus, moved to Austin where she continued to perform and teach piano. She also hosted social events such as the Austin Gilbert and Sullivan Society's monthly soirées. She performed for many years at the Wednesday Morning Music Club; volunteered as an usher at the Capitol City Playhouse, Zachary Scott Theatre, the Paramount, and the University of Texas Performing Arts Center; served on the boards of the Violet Crown Players and the Austin Civic Orchestra; and operated two music stores, Amster Music and Art and Amster Piano Barn. In 1984 the Austin Civic Orchestra named its annual youth concerto competition and scholarship in honor of Pearl Amster for her support of youth performance opportunities. Amster gave piano lessons and held recitals in her Austin home where she lived for thirty-three years. She treated her students like family members and maintained contact with many of them long after they left her tutelage. Gus Amster, to whom she was married for forty-five years, died in 1986, and Pearl Amster died of kidney failure in Austin on September 22, 2000. The couple was survived by two daughters. Austin American-Statesman, September 29, 2000; March 10, 2001. Austin Chronicle, September 29, 2000. Handbook of Texas Online, Cheryl L. Simon, "AMSTER, PEARL," accessed April 18, 2019, http://www.tshaonline.org/handbook/online/articles/fam10.